North Korean cheering squads wave upon their arrival at the Korean-transit office near the Demilitarized Zone in Paju, South Korea, Feb. 7, 2018. 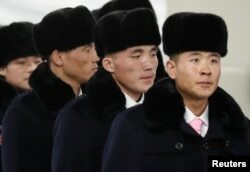 More than 200 sharply dressed North Korean cheerleaders decked out in expensive fur smiled and posed for the media and onlookers Wednesday after arriving in South Korea for the Pyeongchang Olympics. The 229 chic young women wore tailored knee-length scarlet coats with fur hats, fur collars, and matching cuffs to ward off the winter chill. "By the way, I love the North Korean cheering squad's outfit. It's quite something! I want that hat!" said one South Korea fan on Twitter. "I think they are very pretty," said a South Korean onlooker of the women who were part of a 280-member delegation who crossed the Demilitarized Zone that divides the two Koreas at a border post north of Seoul. They were immediately whisked away in a convoy to their hotel in Inje county, a small rural town located 120 kilometers from the Games venue in Pyeongchang. "I am happy to see you," said one cheerleader, beaming broadly but refusing to disclose their cheerleading routine. "You just wait. If I tell you now, it would be less exciting when you see it." The cheerleaders are reportedly the product of a careful selection process in North Korea, screened for their family backgrounds, looks, skills and loyalty to the ruling Workers' Party. The North has sent cheer squads to three international sports events hosted by the South — the 2002 Asian Games in Busan, the 2003 Summer Universiade in Daegu and the 2005 Asian Athletics Championships in Incheon. One of those in the 2005 group, Ri Sol-Ju, went on to become the wife of North Korean leader Kim Jong-Un. "I don't want to say it but North Korea's cheering squad is quite pretty. You can throw stones at me but the truth is the truth," said another observer on Twitter. The young women were given a quick bathroom break at a rest area in Gapyeong, located about halfway to their hotel destination. They strutted past South Koreans onlookers, who snapped out their smartphones for photos of the rare sight. In the bathroom, the cheerleaders stood side by side in front of the mirror, each checking and fixing their make-up while chatting among themselves. Banners welcoming the North's Olympic participation in the February 9-25 Olympics lined the hilly drive up to the Inje Speedium, a four-star luxury resort with a car racing theme park. Surrounded by mountains and seemingly secluded, the resort is seen as an ideal spot for enforcing tight security while at the same time maintaining close surveillance on the large group of Northerners. But hours before the arrival of the guests, the hotel was bustling with media and police officers who had put barriers up at all entrances to the resort. The cheerleaders got off the bus one by one and scurried past the media, who fired questions at the young visitors ranging from their health to the chilly weather. Most quickly walked into the building without saying a word but some occasionally smiled and waved at the camera, and said: "Nice to meet you." At a dinner banquet hosted by South Korea, the cheerleaders — in matching bright red two-piece jackets and skirts complete with Kim Il-Sung and Kim Jong-Il lapel pins — were seen chatting among themselves at round tables. Members of the North Korea cheering group gather before a welcome ceremony inside the Gangneung Olympic Village prior to the 2018 Winter Olympics in Gangneung, South Korea, Feb. 8, 2018. "A new era of reconciliation has been opened," said a North Korean delegate leading the cheer squads, referring to a thaw in North and South Korean relations ahead of the Games. The guests were served grilled scallops, shrimp wrapped in pickled radish, barbecued beef, beef stew, fruit and beer. With only 10 North Korean athletes competing for their country at the Games, and another 12 on the roster of a unified Korean women's ice hockey team, the cheerleaders will reportedly support South Korean athletes when none of their own are in action. The delegation, led by Pyongyang's sports minister Kim Il-Guk, also includes three other officials from the National Olympic Committee, 26 taekwondo demonstrators and 21 journalists. FILE - Kim Yo Jong, sister of North Korean leader Kim Jong Un, is pictured during the official opening of the Ryomyong residential area, a collection of more than a dozen apartment buildings, in Pyongyang, North Korea, April 13, 2017. South Korea's unification ministry said Kim Jong-Un's sister, Kim Yo-Jong, a senior member of the ruling Workers' Party, will also be part of the delegation. But critics in the South allege the North has been allowed to hijack the Pyeongchang Games, dubbing them the Pyongyang Olympics instead.